TDmonthly - Should You Decorate Your Retail Store For The Holidays? If So, How? Should You Decorate Your Retail Store For The Holidays? If So, How? 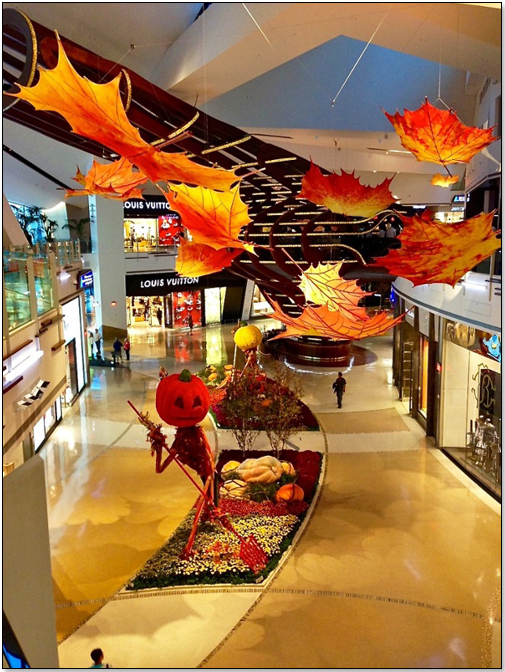 Various seasonal times and holidays can inspire retailers to create magic for their customers. And decorations go far beyond a demonstration of a new skillet or an invitation-only event. Decorating a store goes to the heart of what makes great retailing...It piques a shopper’s curiosity to discover what is new. When you introduce new, yet familiar elements to the shopping experience, you change the energy of your entire store. Christmas, in particular, has the chance for a store to make a statement that wonder and magic lie behind your doors. A brother who never got what he wanted for Christmas could buy his favorite gadget. An aunt who lives thousands of miles away could purchase a token of her love instead of buying a gift card at the local Kwik-E Mart. But if your store looks the same December 10th as it did September 10th, that is less likely to happen. One caveat before I continue, we aren’t talking big budget here. While Saks and Tiffany’s can afford one-of-a-kind window displays and custom elements that customers can activate with their phones, decorating isn’t about technology...it is about creating a different shopping environment. The more you can decorate, the more energy and excitement you bring to passersby. Go big, go early, and go to town. This is what I always recommend. Well-decorated windows truly enchant us to come in and experience the feeling of the season and not just witness it on a street. What does it take to wow an iPhone obsessed, me-centric consumer these days? Lights. When you add strings of lights, you add color, you add energy, you add magic. 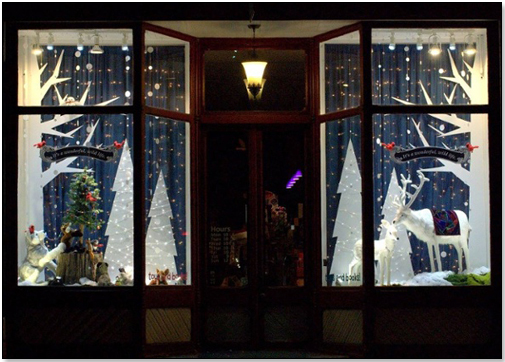 One of the first things I did when I took over a store was to ring the front windows with miniature white lights. 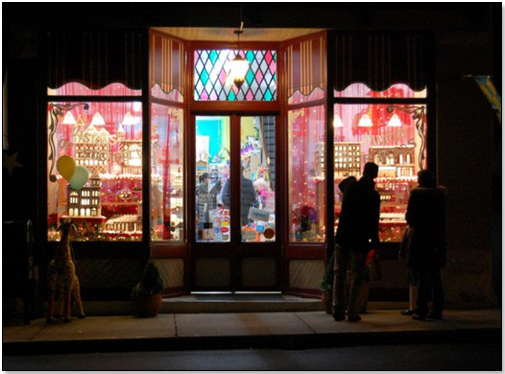 It caught interest, it set us apart from stores on either side, and it brightened up the windows. The more lights throughout your shop, the better. Colors of the season. Whether it is spring pastels or holiday reds and greens, seasonal colors are temporary. Yes decorating your store does take a bit more work as you can’t leave fall leaves through February, but they do align your store with seasonal celebrations. Props that are appropriate help tell a story. It is easy to think of props for a national celebration - think a country’s flag on Independence Days. While a tree or other large prop might be too much for Christmas, your props can be as simple as putting Santa hats on your mannequins. At the start of baseball season, you could add gloves, bats, and balls to those same mannequins. Signage that speaks to the season. So many merchants either avoid or forget well-conceived signs. But you need them, so during the holidays, over a mountain bike with helmet, GoPro and night gear, place a sign that says Dad, Be A Hero To Your Daughter. Around the wedding season, place a sign that says Forget The Tea Towels, Give ‘Em An Experience with a complete baking system and five at-home chef lessons, or around Mother’s Day, Make Up For That Broken Window When You Were 8 for any premium product. You get the idea. 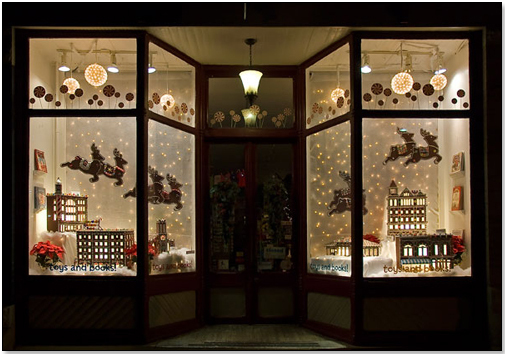 Here are some great examples of two retailers who go all out for seasonal and holiday events. Read the story of how and why they created the magnificent window below here. What should you go all out to avoid? Cheap paper or any other 99¢ table ornaments. A picture of an appropriate holiday decoration instead of the decoration itself. Old decorations that are torn, worn, or just plain ugly. You want to look new, fresh and inviting. There's vintage and then there's garage sale. If in doubt, throw it out. In addition, I always suggest staying clear of any one specific religion to keep your store as welcoming as possible. Yes it's work to create magic but it's a lot more fun than same-old, same-old. There is a reason better merchants pull out all the stops during December – it jolts jaded shoppers into the higher brain area that engages child-like wonder. Look at the cost of a full-on decorated shop as a marketing expense that makes your retail store a destination. A place deserving of a shopper’s time, investment, and curiosity. When you do it right, you turn shoppers into a volunteer marketing army. When you go cheap, you stay another also-ran, bland and boring warehouse of goods in search of someone’s money.